of Messier 43 lies in the top-right hand corner. easily visible even in small telescopes. The telescopic history of the Orion Nebula and the M43 region is quite an interesting story and contains one of the greatest conundrums in astronomy, worthy of a decent detective mystery. First realised by Alexander von Humboldt, none of the observers before Galileo had noted the particularly bright nebulosity, although to the naked-eye today, it is obviously bright and definitely not stellar. Why this was not observed has yet to be properly explained, meaning either that the Orion Nebula was simply not noted or the seemingly highly unlikely possibility that the nebula was not as bright in the time of Galileo. More strange is that nobody else prior to him has written down the visibility of this particularly famous ‘Grand Nebula’ of the entire sky. to the written document text. 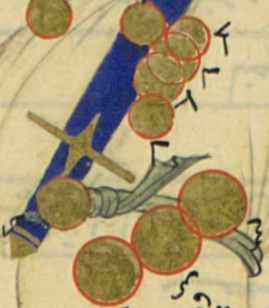 in his Sidereus Nuncius or The Sidereal Messenger. Nicholas Peiresc in November 26th, 1611 who then made the first known telescopic observations, which continued between 6th to 10th December. Written observations of Peiresc states he was “surprised” to find ‘a small illuminated cloud’. This was followed by Johann Baptist Cysat (Cysatus), a Swiss Jesuit priest, made the next known observation in 1618, while comparing the nebulae with a close-by comet that was visible at the time. 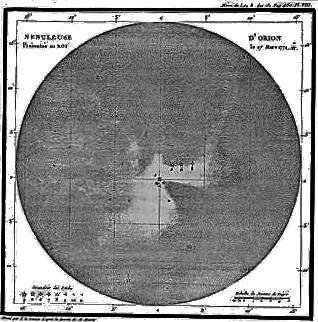 Christian Huygens gave the first detailed description using a Galilean telescope in 1656. Huygens thought he had discovered M42 for the first time, and subsequently published observations in his Systema Saturnium, a few months after the original observation. It contained his full description and drawing, and told of the remarkable star Theta (One) Orionis (θ1 Ori) in the very heart of the nebula. 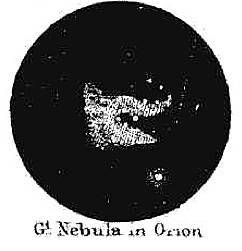 His original sketch, contains seven stars inside the nebula, with five lying just beyond it. The stars of the Trapezium, he curiously only notes as three stars, though for the telescope aperture used, he should have easily seen all four. Noting that the observations made by him were different from Huygens, William Herschel stated in December 1810 the belief that the nebula had actually changed. Some thirty-seven years later, he was absolutely convinced that several stars had actually dissipated their nebulosities. By comparing his sketches, he also noted changes in the appearance of the nebula’s internal structures. It seems, by our knowledge of the meticulous detail of his observations, it is likely that these changes were real. Later other were to question the same thing about other nebulae like Eta (η) Carinae. Compared to modern observations, several prominent and obvious stars of the Trapezium are missing. I.e. The ‘E’ and ‘F’ stars. Wilhelm Struve, as late as 1826, discovered the fifth ‘E’ star of the Trapezium. His magnitude estimations, show it has brightened considerably in the last 180 years. Some have speculated that many of these stars are very very young. The 110 stars discovered in the inner portions of the nebulae each show embryonic material, and proto-planetary disks which are being ‘shredded’ over a short time. 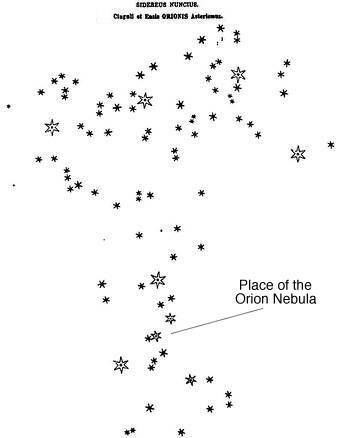 In 1936, observations the variable star FU Orionis was found to have brightened by at least six magnitudes over a short period of several months! Ever since this star shows small fluctuations in brightness but has remained at an elevated average of 10.3 magnitude. Another two fainter variables of V1057 Cyg and V1517 Cyg also have shown similar phenomena. It is very possible that these stars may have switched to a more energetic process, or that the star has suddenly ejected the incipient nebulosity that surrounds them. This may be the case with other stars observed in this region. Observation using infra-red wavelengths and the Hubble Space Telescope (1994-95) have revealed many observational details of the formation and cause of such brightening. “For a change we will now try our telescope on a nebula, selecting the great nebula in the Sword. 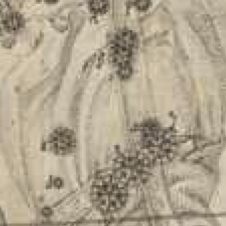 The place of this object is indicated in Plate 2. There can be no difficulty in finding it since it is clearly visible to the naked eye on a moonless night… [being] the only sort of night on which an observer would care to look at nebulae A low power should be employed. It was decided, therefore, that assuredly the great nebula is a congeries of stars, and not a mass of nebulous matter as had been surmised by Sir W. Herschel. And therefore astronomers were not a little surprised when it was proved by Mr. Huggins’ spectrum-analysis that the nebula consists of gaseous matter. How widely extended this gaseous universe may be we cannot say. The general opinion is that the nebulae are removed far beyond the fixed stars. If this were so, the dimensions of the Orion nebula would be indeed enormous, far larger probably than those of the whole system whereof our sun is a member. I believe this view is founded on insufficient evidence, but this would not be the place to discuss the subject. I shall merely point out that the nebula occurs in a region rich in stars, and if it is not, like the great nebula in Argo, clustered around a remarkable star, it is found associated in a manner which I cannot look upon as accidental with a set of small-magnitude stars, and notably with the trapezium which surrounds that very remarkable black gap within the nebula. The fact that the nebula shares the proper motion of the trapezium appears inexplicable if the nebula is really far out in space beyond the trapezium. A very small proper motion of the trapezium (alone) would long since have destroyed the remarkable agreement in the position of the dark gap and the trapezium which has been noticed for so many years. The star [See Fig.3 Above] below the nebula is involved in a strong nebulosity. And in searching over this region we meet with delicate double, triple, and multiple stars, which made the survey interesting with almost any power that may be applied. These possible changes in the whole area are certainly curious. It is hard to reconcile how the observers before Pieresc could have missed such an obvious object, unless there was a sudden brightening of M42/M43 at the time of the introduction of telescopic observations. It is possible, if this hypothesis is correct, that the nebula started rapidly to brighten a few years before the observations of Huygens. An explanation of the mechanism could be the simultaneous ‘throwing off’ of the embryonic nebulosity of the stars in the Orion Nebula. This would cause the stars to brighten suddenly, like FU Orionis. They would then expose the surrounding nebulosity of the whole region to the intense UV radiations of the stars. Over perhaps a few decades or centuries, the material contained in the nebula begins to shine by its own light, becoming the brightest of all emission nebulae. It is truly compelling to think that perhaps the Orion Nebula may in fact be a very new object, which has actually has evolved even further since the invention of the telescope just over four-hundred odd years ago. Now at the beginning of the twenty-first century, the Orion Nebula or NGC 1975-1980 is visually one of the brightest of the nebulae seen in the sky. This magnificent object is a bright emission nebula that is still spectacular even in light-polluted skies. The most modest telescopes can make out the general shape, and its greenish colour. Using even the largest of telescopes, we can observe something new that we have not noticed before. Commonly we call it the Great Nebula in Orion M42 is found lying in the middle of the sword of Orion, or the handle of the saucepan, as seen from the southern hemisphere. In even moderate telescopes it is a truly grand object and words cannot adequately describe this nebula as it truly appears. 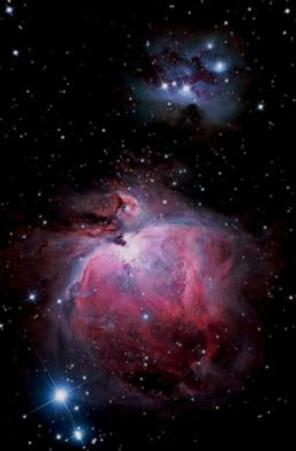 My own impression of the Orion Nebula is firmly fixed in my head. As the one of the first objects that I observed with a small 60mm refractor, I can still recall being fascinated by the faint, but highly delicate nebulosity. A sharp boundary to darker portions contrasts the ‘bowl’ of the nebula. The most obvious feature is the boundary of light call the Bright Bar. Naturally, when observing it with a much larger telescope, the subtle differences in the surface brightness become obvious, with a mottled surface inter-dispersed with faint filaments. 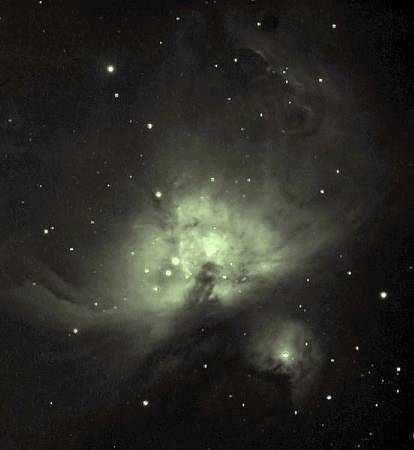 Image of the Orion Nebula as seen in 20cm telescope. The pale green colour is approximately the colour seen in the telescope. Older observers might not seen this colouration at all due to the colour loss under darkened conditions, which is mainly due to the ageing process. One of the first astronomical photographs taken of this object was allegedly made by American spectroscopist, Henry Draper, at the Harvard College Observatory in 1880. It is obviously a favourite object among those interested in astrophotography or imaging and is truly the most photographed object in the sky! A small telescope, with the short time in guiding, produces truly magnificent results. For the amateur astrophotographer it is likely the first object attempted. It remains a popular photograph in astronomical periodicals, advertising materials and in books. For example, it has been in each issue of the magazine Sky and Telescope for the past seventeen years (2005)! Many parts of M42 we see in the bright nebulosity are illuminated by stars associated whose structure making the individual parts of the nebulosity appear so luminescent. In reality, this nebula brightness is because of the molecules and atoms contained within the nebula itself. Excitation of this ionised material is by the energies from the many nearby hot stars that are radiating strong UV radiation — causing the familiar fluorescent glow. A large proportion of M42 is possibly illuminated by the star known as Becklin-Neugebauer Object (BNO) or sometimes just Becklin’s Object, which remains visually unseen due to significant absorption of light by the bulk of the nebulosity. Discovered by Eric Becklin and Gerry Neugebauer in 1967, this hidden object appears as the brightest star in the sky at near infrared (NIR) wavelengths (or thermal infrared) at about 2μ to 10μ (microns). Such wavelengths are equivalent to temperatures emitted by the human body. The nature of this star is thought to be a high mass protostar that is in the process of emerging from its embryonic nebulosity from which it recently formed. In more recent times (1993), there was found also another very close object known as IRc2 which seems likely to be a trapezium-like multiple star. Both these stars are some 0.5pc. (1.6 ly.) behind the bright bowl of the Orion Nebula. Origin of the BHO protostar is uncertain and there are several options being considered by astronomers. In true size of the nebula covers about 1¼ square degrees of the sky, roughly equivalent to be between seven and eight times the apparent area of the Moon. M42 is 66′×60′ in size, while to the north is M43 that measures some 20′× 14′. Combined magnitude of the nebula for M42 is equal to any 2nd magnitude star, while the star known as θ1 Orionis has the combined visual magnitude of 2.9v. This star is also known as the multiple star HJ 4581 / h.4581, which was first catalogued by John Herschel. Astronomers have estimated that the nebula’s total masses, is somewhere between 3,000 ΣM⊙ and 5,000 ΣM⊙. Distance to the nebula has been presently estimated to be between 430±60 pc. (370pc. to 490pc) or roughly 1,400±200 ly. (1,200 ly. to 1,600 ly.) However, most of the literature now often tends towards the higher values. In true size, the bright ‘fan-shaped’ section of M42 is estimated to be about 8 to 15 ly. across, while the maximum size revealed by the photographic process, measures at about 30 to 35 ly.! We have measured the nebula to approach the Earth at 25 km.s-1 (8 km.s-1 less than stated by Hartung). The Trapezium is travelling at a slower velocity of −11 km.s-1. No one knows for sure about the future of the nebula of M42, but it seems the stellar creation process is still going on. Some have suggested that the nebulosity will become even more brilliant perhaps sometime within the next million years or so. Projected distances in AU and light years between the Trapezium components; all from the star A. In physical size, therefore for the Trapezium is roughly about 10,000 AU across. The largest estimated minimum orbital period of these stars is about 250,000 years or about 2½ times that of Alpha Centauri AB to Proxima. This augers well with the fractional movements so far observed with these stars. You could compare these values with the older ones described in the dated “Burnham’s Celestial Handbook” Vol. 2 “Orion” on Theta Orionis. Note: If value were between 1400 to 1600 light years, these projected separations would be slightly larger.